Shirt is a staple for any man's wardrobe. ZF Fashions by keeping up with latest trend and adapting to changing styles of menswear, brings an ultimate collection of both formal an casual shirts. Like women, men today are also fashion driven and demand different styles and quality in each style. 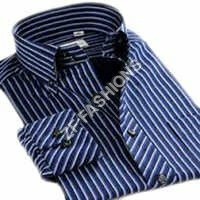 The shirts made in-house differ in terms of fabric, front design, placket styles, back design, collar design, cuff styles, hem design and shirt elements. Every small detail in the designing and production are kept in mind to stand tall in this competitive industry. The buyers can opt for either solid, printed, checked or striped shirts. The fabric options we provide are numerous. Pair any of these shirts with a matching trouser, tuck-in the long shirt tail and get a perfect look for office wear, or weekend wear. In winters, you can also add a tie, blazer and formal shoe for a perfect professional look.